"I don't have it all figured out," says 21-year-old Lifehouse singer-guitarist-songwriter Jason Wade. "You learn so many things every day, and it's overwhelming sometimes trying to see how it all fits together. I'm starting to realize that each day is a different road and a different journey, and you don't have to have it all figured out; you don't have to have all the answers to everything right now." One of the things Jason hasn't figured out is how Lifehouse - which also includes bassist Sergio Andrade and drummer Rick Woolstenhulme - went from playing a few college shows to sharing the road with Pearl Jam, Fuel, Everclear and Matchbox Twenty and touring all over North American and Europe. Perhaps even more incomprehensible is how this once obscure Los Angles band scored a #1hit on Billboard's Modern Rock Tracks chart, with first radio cut "Hanging By A Moment," only 10 weeks after the release of their debut album, the now-double-platinum No Name Face (issued Oct. 31, 2000, on DreamWorks Records). Jason, Sergio and Rick were equally incredulous when the song soared to the #2 spot of the Hot 100 and the Top 10 of the Mainstream Rock Tracks list, sending No Name Face to #6 on the Billboard 200 album chart. The "Hanging By A Moment" video, meanwhile, earned a place on MTV's "Total Request Live" and was #1-most-played on VH1 for six straight weeks. "Sick Cycle Carousel," the follow-up to "Hanging By A Moment," quickly leapt onto Modern Rock charts when it was introduced to radio. The clip for that track - which Jason calls "part Tim Burton fantasyland, part reality" - was overseen by acclaimed director Marcos Siega (Blink 182, Papa Roach, Weezer). The band performed "Sick Cycle Carousel" on "The Tonight Show With Jay Leno," as they had "Hanging By A Moment." Audiences attending a taping of "The Late Late Show With Craig Kilborn" had also been treated to a live version of "Moment." The members of Lifehouse have even read about themselves in a Rolling Stone feature (June 7, 2001), and the Boston Globe's Steve Morse called No Name Face "a stunning debut for a band just out of their teens," describing it as "a collection of disarmingly open, innocent, questing, melodic rock songs filled with internal dramas and alternative edges" (March 9, 2001). Other print outlets chimed in as well. 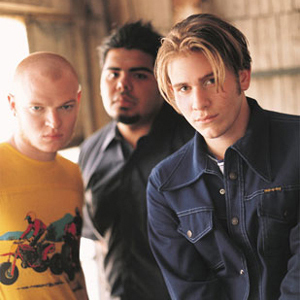 Remarked Seventeen, "Lifehouse infuses adrenaline-fueled anthems with life-affirming mantras" (January 2001). The Philadelphia Daily News opined, "Of this season's young rockers crop, Lifehouse jumps from the crowd with No Name Face" (Dec. 1, 2000). Billboard commented: "The potent, guitar-based 'Hanging By A Moment' stakes out a spot on the same ground as bands like Creed and Pearl Jam, possessing commercial accessibility without shedding the meaty musical substance that weeds out the poseurs from the real thing" (Nov. 18, 2000). "It's all been unbelievable," Jason says of the band's rapidly accumulating success. "We didn't expect any of this, but we're so grateful to have so many people hearing our songs. I really can't explain how it's happened." In fact, the trio's frontman is hard-pressed to explain most of the unexpected twists his life has taken. His early years in Camarillo, Calif., for instance, would suggest an all-American boyhood, but then his family began touring the Far East, visiting Japan, Thailand and Singapore before moving to Hong Kong. Moreover, he confesses to having little interest in music until his parents split up and the songs just started pouring out of him. "This record deals a lot with self-discovery and breaking out of whatever your parents or your boss or whoever thinks you should be, says Jason of No Name Face. "It's about trying to find out for yourself who you're supposed to be - your purpose, your destiny in the world." Reluctant to discuss his lyrics in detail, Jason feels they are infinitely open to interpretation. "That's the great thing about a song - a lyric may mean something totally different for someone else than it does for me and still be just as valid," he insists. A case in point is album closer "Everything": "We've been playing it on tour and when kids come up after the show, it seems like they always tell us how much they love that song. They don't really know what it's about, but they hear something in it that connects to them personally. That's why you don't have to tell the whole picture in the lyrics; you give a road to start on that people can relate to." Jason understands firsthand how bleak life can seem without something or someone to relate to. "When I was a kid and we lived in Hong Kong, we lived in a small village and the people there hated us," he says. "They thought we were witches bringing trouble to their neighborhood. They lit firecrackers at our door every morning, and they actually stole our cat, cooked it and ate it! I was totally scared and freaked out and I didn't have any friends." After four difficult years, Jason's family moved back to the U.S., to Portland, Ore. Asked why, he ventures: "My parents had a lot of issues. But they wouldn't allow me to see the problems in their relationship. Our family was always peaceful; there was never any fighting or anything. We looked perfectly happy from the outside. It was like 'Pleasantville.' The worst part was that I couldn't acknowledge anything was wrong, so I couldn't do anything about it. I felt completely powerless." By the time he was 12, Jason's parents had divorced and he'd moved with his mom to the Seattle area. He spent most of his early days there alone in his room, pouring his heart out in poetry. "I was experiencing all the pain anyone feels when their parents get divorced. It opened up all this stuff," he confides. "But it also opened up this creative outlet for me. It's funny, because I was never a musical kid - never took lessons, never really listened to the radio. But I suddenly just started writing lyrics and coming up with melodies. We lived in the woods, and I'd take these long walks and the songs would just start happening." Jason's mother had been musical. "My mom always had a guitar lying around the house," he recollects. "I finally just picked it up and learned how to play a few chords." Having found some solace in music, he eventually began reconciling himself to his new circumstances and settled into his new home. This phase of his life ended, however, when his mother decided to relocate the family to Los Angeles. "I didn't want to move at all," he attests. "I'd finally made all these friends, and Washington had been a really comforting place for me during the divorce. I thought it would be home forever." So, at 15, Jason moved to L.A., where he hooked up with bassist Sergio Andrade and began blossoming as a songwriter. "I really didn't know anyone. Serge lived next door and we had a lot of stuff in common, like playing basketball and running," he says. "He'd just started playing bass, so we hung out a lot. We spent all our time jamming out in the garage, writing songs and helping each other get better." Originally from Guatemala City, Sergio left his homeland at age 14 to move to California. He, too, had a musical parent. "My father played piano," he confirms, "and I ended up playing keyboards." He gravitated toward rock, pop and Latin styles, also playing trombone and flute in the school orchestra. Sergio later switched to drums and then bass, becoming somewhat obsessed with the instrument - "All I did was play bass," he says. "I knew Jason was a talented guy, but that wasn't what mattered to me," Sergio continues. "I was still learning English and really didn't know anyone. I just wanted to be involved in music and make some friends." The two paired with a drummer (who has since left the group) and after honing their sound for a few more months, inaugurated a Friday-night residency at a local school auditorium. The gatherings were casual events where the band was afforded onstage jam time (some of these jams became songs, among them "Everything"). "They had a really good P.A. system there and we could do whatever we wanted," Jason reports. "We got smoke machines and lights and basically turned it into this little club scene. Kids would come from all over, and we started filling the place up. At one point we were getting, like, 450 people out every week. That went on for two years." Word-of-mouth about the band soon reached No Name Face producer Ron Aniello, who let them make some rudimentary recordings at his home studio. Drummer Rick Woolstenhulme also heard about the band through the grapevine. Born and raised in the Arizona farm town of Gilbert, he says he was one of those kids who was always pounding on things. "My mom plays piano, my dad plays piano and guitar and my brother plays guitar," Rick relates. "I guess they decided I was the next musician in the family, so they got me this beat-up old kit and I started taking lessons right away." Rick went on to attend The Los Angeles Music Academy and has played drums and percussion ever since. "I was playing with this other group," he says of his earliest, accidental exposure to Lifehouse, "and Jason and Serge were practicing in the next room - I'd bump into them in the hallway." A while later, someone suggested to Rick that he check out a band called Lifehouse, who were looking for a new drummer. "The name didn't ring a bell for me. Even after I officially met these guys, we didn't make the connection right away," he recalls. "It was a couple weeks of 'I've seen you somewhere' and 'You look really familiar' before we figured it out." Says Jason: "It was one of those weird coincidences. As soon as we met and started playing with Rick we knew he was the guy. It just clicked. We'd all go to the beach and Burger King and just do nothing together. We knew right away it was going to work." Attests Rick: "It was really smooth - I just sort of snapped on." Sergio says of the band's collaboration: "Jason would usually have the song written before he'd bring it to us. Then we all kind of arrange it together. The way we work on songs feels really natural, which I think has a lot to do with us being tight as a band and as friends." Aniello saw the progress Lifehouse was making but felt the band needed more time to develop before recording an album. So Jason kept on writing, and the trio continued to rehearse intensively and play gigs, including some at local colleges. Comments Sergio: "We went through a lot of phases trying to find our own sound. We learned from our mistakes. We'd see tapes of ourselves onstage and go, 'This is horrible.' But we'd just say, 'Okay, we gotta fix it' and go back and practice some more." Jason stayed in touch with Aniello. Two years passed, and then he played No Name Face track "Breathing" for the producer. "He got really excited about it," Jason says, "and he played it for his friend Jude Cole, who's our manager now." "I was blown away by what I heard," says Cole. "Here were these teenagers skateboarding around their tract-house neighborhood and banging out this really deep music in the garage. I was totally moved by 'Breathing' - it was the kind of song that captures a moment in time, the kind you always remember where you were when you first heard it. Jason was only 17, but he already had that incredibly resonant voice. I was also impressed by his writing and guitar work. He had an instinctive understanding of how to create a mood. Even before Ron started playing me their other stuff, I knew I had to work with this band." Cole immediately called DreamWorks Records principal Michael Ostin, who had been Cole's own A&R representative when Cole was a recording artist. In 1998, DreamWorks funded Lifehouse's first real demos, which Aniello produced. Many of these tracks made their way to No Name Face. "When we tried to re-record some of the songs for the album, we just couldn't get the same spirit the demos had," Jason says. "The demos had been recorded right after the songs were written and even though they weren't perfect, they were so real, so honest." "Trying," for instance, is fundamentally the same recording Jason made at Ron's home studio when he was 15, with one significant change: "I had to go back in and re-record my vocals for the album because my voice had changed." The rest of No Name Face was also cut mostly at Aniello's home studio. "Ron's studio is right down the street from us," Jason says. "If we'd been working really late, we'd just spend the night there. We'd wake up, have breakfast with Ron and get right back to it. He's been like a father to me in a lot of ways, and the whole recording process had this homegrown, family feel that made it so easy to be creative. I wrote 'Hanging By A Moment' in the studio while we were finishing some other stuff." Jason's trust in Aniello helped make these sessions a learning experience. "I came in wanting it to be all slick and fancy," he admits. "I was so excited to be in the studio making a record - I wanted every instrument and every effect on the planet. Ron said pretty early that he felt the record should sound organic, that the production should be simple and transparent. I'd have all these ideas, and we did use some of them, but after a while I realized he was right. The record needed to sound more raw." This sonic edge was indeed the right complement to Lifehouse's emotionally charged songs. Evidence of that can be found in the thousands of calls placed to Modern Rock stations across America requesting "Hanging By A Moment" and "Sick Cycle Carousel." "The best thing about all this is being able to stay on the road," says Jason. "We've been meeting new fans in cities all over the country. It's so cool to hear what they think about the music, and it makes me feel so good when they say that one of our songs has helped them get through a rough time, that they were able to apply it to their own life." To be sure, this is the sort of opportunity only afforded a band on the way up. But Jason and his mates have had no trouble staying grounded amid all the hubbub. After all, it's not like they've actually met Pearl Jam. "We love Pearl Jam," Jason says. "Once we got over the shock of actually being on tour with them, we went backstage to hang out with them. But security would never let us through the door. We tried a bunch of times and could never get in. I'm sure the band didn't even know about it. And, of course, security had no idea who we were - we were just some fans." Being "just a fan," a music lover like any other, is what Jason is and always wants to be. "My ultimate goal in writing songs is simply to connect with people," he says, "and I hope that comes across in everything we do."